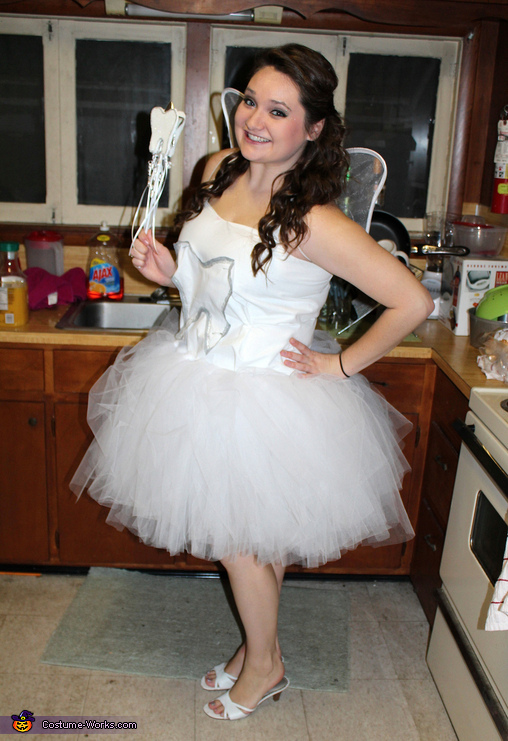 Tooth Fairy: My costume was completely handmade. I bought white fabric to hand sew the top. I cut out a large tooth from the white fabric and outlined it with silver glitter paint. I tied pieces of white tulle around an elastic band in order to create the tutu. I cut out teeth from foam board and placed one on the top of a stick with curled ribbon for wand, glued another foam tooth to a dollar store hair barette, and placed another in a small sack that I made from the left over tulle. I only bought white wings.